Hello everyone. This week, you’ve caught me out west, doing a nine-day series in a university town for a small church. I was recently reminded of this verse by a confused (but sincere) soul who was genuinely wrestling with his beliefs. 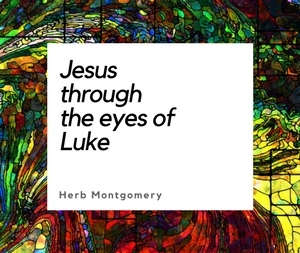 Does God, he wondered, really relate to us in the way we see Jesus relating to those he came into contact with? I can’t tell you how many times over the last twenty years I have met dear people struggling with this week’s verse. So, what do we do? Well, here’s an eSight on it for starters. First, let’s start off on the right footing. After three years of being mentored by Jesus, one of Jesus’ closest disciples summed up the revelation of God we get through Jesus in three words: “God is love.” (I John 4.8) John goes on to say that “We love, because He first loved us.” This is the principle that love can only be awakened by love. It cannot be coerced, manipulated, or contrived. It can only be awakened, and it can only be awakened by encountering love itself. This is just as true of forgiveness. We forgive others because He first forgave us. But how many of you reading this week have struggled for your entire lives to believe that God truly forgives you? Let’s back up and make sure we correctly understand Jesus’ words here. Yet, the very real fear among those listening to Jesus’ teachings was that Rome, instead of responding to their forgiveness and their enemy-embracing love, would simply take advantage of it, using it to walk all over Israel even more frequently. Jesus’ audience was tempted to fear that Jesus was planning to turn Israel into Rome’s doormat. So if Jesus wasn’t talking about individual, privatized sin in Matthew 6, where does he teach about that? Well, actually, he spent his whole life putting that teaching on display: from the woman caught in adultery, to whom before she repented, Jesus whispered, “I am not condemning you,” to the woman at the well, to whom he said, “I know everything about you and my offer is still on the table.” Jesus walked the Earth displaying the radical and—to some—“dangerous” favor of God. The God that Jesus reveals is not one who is against us, and who must be won through our groveling and repentance. Instead, Jesus reveals a God who is and always has been for us, on our side. This God forgives us, for we know not what we do, and seeks to win us away from our current path, which will in death, and guide us to the path, narrow as it may be, that resembles Jesus (see John 14.6) and that ends in life. What Jesus is offering us in Matthew 6 is the beginning of a whole new world changed by the reign of Jesus. With our forgiving of others, God will make sure that what we have done to others will be forgiven by them. Jesus is not saying that God will harbor ill feelings toward you until you muster up enough strength to forgive others. He is saying that by our letting others off the hook, by believing the best about them, by giving them second chances, and by seeking to restore the rights of other victims rather than always defending our own, we are creating a new world. We are setting into motion a more forgiving world where through our forgiveness, the forgiveness in others is awakened. One day, this forgiveness will work its way back into the hearts of those whom we have offended. Then, God will be able to win them, too, into this new world, so that they may forgive us. 1. This week, I want you prayerfully come up with five names: five people who are fulfilling the role of “the Romans” in your life today. 2. I want you to dedicate time each day, for the next seven days, to praying blessings on them. You don’t have to feel anything positive for them in your heart, yet. Just pray for them. Take notes of the fears and the “what-ifs” that surface in your heart. Write those down. Submit them to Jesus and then stop, watch, and listen to what He says about each one. 3. Share what Jesus shows you concerning the forgiveness of others with your HeartGroup in this upcoming week.